Academic networks are essential to the development of higher education. They support disciplines, specialist interest groups and broader fields of knowledge, providing an important mechanism to share knowledge, support community building and encourage scholarship and innovation. A challenge many networks face is ensuring sustainable practices and a strong membership base. Effective leadership is critical to a network’s ongoing success and development, particularly in promoting member engagement. Leading Academic Networks offers a complete tool kit for network leaders. Drawing on principles of leadership and management and successful network practices it explores a highly strategic approach to leading networks and their executive committees. 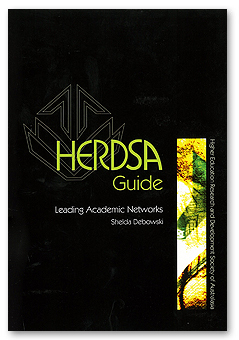 This practical guide offers insight into the nature and features of academic network structures and design; the role of the network leader; developing the network strategy; managing the network’s activities, including financial and executive committee practices; developing an effective engagement strategy; and handing over to a new leader. Useful reflective tools are provided to assist networks and leaders in assessing their practices and effectiveness. Leading Academic Networks is an essential and practical guide to new and experienced network leaders. It provides the necessary induction to prepare new leaders for their role and acts as an ongoing resource for existing leaders to assess how they might more effectively enhance their network’s outcomes.